8 August 2017. A biomedical engineering team created a chip device attached to a smartphone that detects indicators of disease in blood faster than today’s more expensive lab tests. The device is described by researchers from Duke University and University of California in Los Angeles in yesterday’s issue of Proceedings of the National Academy of Sciences (paid subscription required). The team from the lab of Duke engineering professor Ashutosh Chilkoti is seeking better and faster ways to diagnose disease at the point of care, rather than sending off patients’ specimens to a separate lab for analysis. The leading quantitative diagnostics method today is the enzyme-linked immunosorbent assay or Elisa that identifies and measures the number of antigens — proteins triggering an immune response — in blood samples. Elisa is a sensitive technology that tests for a number of different conditions, but it uses stationary desktop or larger equipment, needs trained technicians or robotics to expertly handle blood samples, and can take as long as a day to return results. Chilkoti and colleagues aim to provide the same level of sensitivity as Elisa, but in a faster, simpler, and less expensive technology available to clinicians at the patient’s bedside. The researchers devised a solution with antibodies formulated into nanoscale polymer brushes on glass slides. The nanoscale brushes are applied with inkjet printing on a non-stick polymer substrate, to prevent fouling the slide’s surface. The non-stick feature is important, since it enables the system, called the D4 assay, to detect low levels of antigens in samples. Like Elisa tests, the D4 assay identifies and measures the number antigens in a blood sample, but in this case only a drop of blood is needed. The D4 assay is configured to work like a specific method called sandwich Elisa that provides highly sensitive and efficient testing. The “sandwich” in this case tests for antigens between two layers of matched antibodies, one layer of immobilized antibodies for binding to antigens and the second layer of soluble antibodies for detection. Targeted antibodies are attached to fluorescent markers to aid detection and measurement. 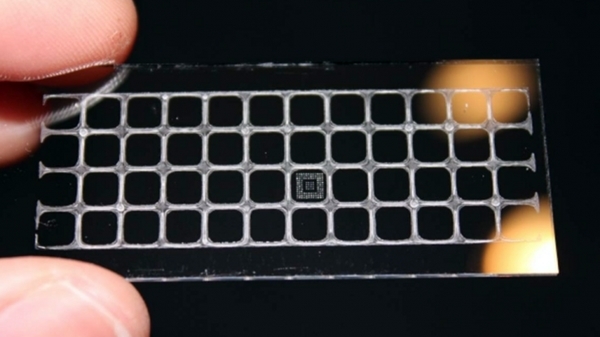 Colleagues at UCLA devised a 3-D printed smartphone attachment for the D4 assay, enabling the system to be deployed in field hospitals and other limited resource settings. The smartphone attachment is a product of the photonics lab of Aydogan Ozcan, featured previously in Science & Enterprise for its smartphone attachment to display and measure DNA molecules. The researchers evaluated the D4 assay in a proof-of-concept study among patients at the Duke University Medical Center, measuring serum leptin levels. Michael Freemark, a pediatrics professor at Duke and co-author of the paper, earlier found low levels of the hormone leptin in blood can predict mortality and complications in severely malnourished children, particularly in developing regions of the world, where Elisa systems are limited. The findings show the D4 system detected and measured serum leptin levels similarly to Elisa equipment, returning results much quicker, in some cases as fast as 15 minutes. First authors of the paper Daniel Joh and Angus Hucknall plan to field test the D4 assay in Liberia, also to detect and measure serum leptin levels. Hucknall and Chilkoti founded the company Sentilus in 2012 to commercialize their nanoscale polymer brush technology. Two years later the company was acquired by Immucor Inc., a blood testing enterprise in Norcross, Georgia that today owns the rights to the technology.